Innovation makes it easier to grow, regardless of the size of the business. You might have a small startup, but if you innovate, you can grow your business. The same is true for a fortune 500 company. It might be a huge corporation, but it can take even more of the market share if it manages to innovate. It’s easy for innovative companies to grow. Your company fits inside a specific niche or industry, and it’s far from alone. Let’s say, for example, you manufacture light bulbs. Tons of companies also manufacture light bulbs, and you need to stand out in some way. You can do that through innovation. The right innovation will allow you to offer something unique to your customers. For instance, what if you managed to create a light bulb that automatically turned off when people left the room? That’s a crazy example, but that’s how some of the best innovations work. Top innovators take popular products and make them even better. That makes brands stand out in the market and makes it easy for companies to increase revenue. Customer needs are constantly changing. One day, your customers might need exactly what you have to offer, and the next day, they might need something else. Innovators predict changes in the market and provide solutions before people even realize they need them. You cannot meet your customers’ needs on a long-term basis unless you are willing to innovate. If you remain stagnant, your business will eventually flounder. You have to come up with new ideas that excite your customers and meet their needs if you want to have staying power. Talented, innovative people want to work for innovative companies. You aren’t going to attract someone who is going to create the next big thing unless your company has a history of creating. Innovators want to be challenged and encouraged to create on a regular basis, so you need a culture of innovation to recruit that talent. Make a name for your company by being innovative and then watch the resumes pile in. Innovators from all over will want to work with you, and then something magical will happen. Your company will become even more innovative. You will experience more growth, stand out from competition even more, and meet your customers’ needs in ways you never imagined. That’s when your company will reach an entirely new level. It’s normal to want to maintain the status quo. You assume that since it’s worked for you in the past, it will work for you in the future. In reality, the status quo only works for so long. If you’re going to keep your doors open, you have to innovate. You need to take the risks that come with innovation so you can enjoy all of the rewards. We hear the term “innovation” everywhere and are made to believe in its importance. For many of us, innovation means providing ideas out of the blue, leading to significant discoveries and achievements. However, there’s more to it than that. Let’s take a look at the formal definition of both “creation” and “innovation,” since most people will mistakenly use them interchangeably. According to Merriam-Webster, the term creation means having the quality or power to create and is the act of making, inventing or producing. Innovation is defined as the introduction of something new or different. The act of innovating leads to the introduction of new ideas, devices or methods. In short, creativity plus work results in innovation. Therefore, being innovative means you harness your creative ability. Originally, highway maintenance crews were forced to visit individual production plants before starting road repairs in order to collect fresh, hot asphalt materials. This not only used up valuable time but also led to the wasted material because of particular temperature requirements. In other words, just because something makes front-page news doesn’t mean it has more impact. Some companies, products, and ideas revolutionize certain aspects of our lives more quietly. Sense-T is an intelligent farming initiative that utilizes sensor data to optimize farming operations. Haven’t heard of them? Neither had I. But they have a massive impact in the world of sensors and the internet of things. 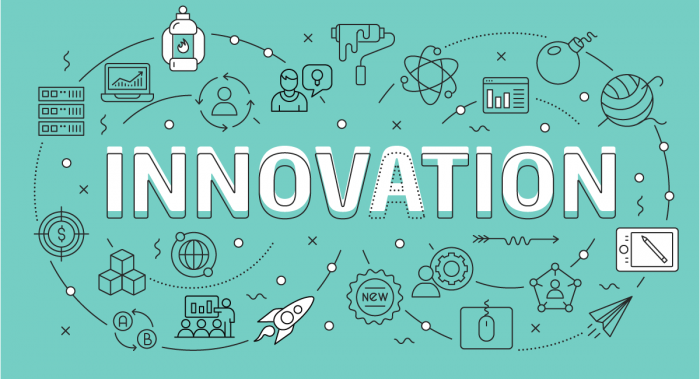 Innovation is vital in the workplace because it gives companies an edge in penetrating markets faster and provides a better connection to developing markets, which can lead to bigger opportunities, especially in rich countries. Innovation can also help develop original concepts while giving the innovator a proactive, confident attitude to take risks and get things done. When a company has an innovative culture, it’ll grow easily, despite the fact that the creative process isn’t always simple. Tried-and-tested methods may be reliable, but trying out new things is a worthwhile experiment. Aside from products, innovation can also pertain to new services, business models, processes, and functions. Companies such as Google and Starbucks have implemented game-changing innovations in small ways that add to the big picture. Notice Starbucks doesn’t do small, medium and large cups. They have their own language such as grande and venti. They even have their own payment app designed with PayPal. If you use Google, you may start with a search but end up using Google Docs or Google Hangouts. As a professor and trainer who teaches a series of innovation and creativity programs, I can tell you from an observation that innovation is not for geniuses working alone. It is a group activity and is definitely a teachable skill. Being innovative should always be a part of your approach. With creative thinking, problems can be solved differently and strategically. The right innovative techniques can help you save precious time and money, and give you a competitive lead in expanding your business. Tremendous efficiencies are experienced because of the development and use of new strategies. One way to experience this is when distinctly different ideas come from different minds. Don’t be afraid to surround yourself with people who have ideas that differ from yours. You’ll come up with diverse ideas that you can pool to achieve a different approach from what has always been done – and that is what you call motivation.